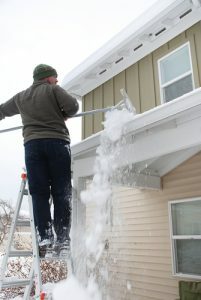 Winter home maintenance protects your investment property from the season’s harsh demands. A little preventative maintenance each year goes a long way toward safeguarding the building, protecting renters and warding off major repairs. Winter landscaping. As winter approaches, trim trees and shrubs away from the home. Weighed down with snow and ice, shrubs can damage your home. As you put the lawn and garden to bed for the winter, disconnect garden hoses. Apply a winter fertilizer to your lawn to nourish it through winter and decrease spring lawn maintenance. During winter, shovel snow promptly. If left in place, the snow can melt and turn to ice. If a tenant slips and falls, you could be held legally liable. HVAC servicing. Your heating and air-conditioning system should be serviced annually. During servicing, a technician will check all parts of the system, make repairs for efficiency, and replace the filter so air circulating in the home is clean. Chimney servicing. If your home has a chimney, it requires annual servicing. Birds, bats and squirrels can make a home in the chimney. Chimney sweeps can fit your chimney with a secure cap that keeps animals out. They can also clean the chimney and make structural repairs. Gutter cleaning. Cleaning leaves and debris from gutters ensures that snowmelt can drain. If you forget to clean the gutters, ice dams may develop. These can ruin your gutters and cause water damage if melted snow leaks into your home. Wait until late fall, when all the leaves have fallen, to undertake this task. Check the water heater. Every two years, a water heater should be flushed of mineral deposits. This is also a good time to check your water heater’s remaining life span. Since newer water heaters are more efficient, replacing an old water heater will save money. Prevent pipes from freezing. Pipes may freeze and burst if interior home temperatures fall under 55 degrees Fahrenheit. Keep the heat set above 55 degrees throughout winter. Educate your renters on this important safety consideration, so they do not accidentally cause pipes to burst. Winter property maintenance represents money well spent, because it saves you money down the road. There is no question that paying a small amount of money to service equipment, like a chimney or HVAC system, keeps the unit in good working order. Without regular maintenance, you may wind up with a winter heating emergency that’s expensive to fix. Meanwhile, your renters may become unhappy. In a worst-case scenario, they could decide to terminate the lease, leaving you searching for new tenants. Home maintenance tasks also keep your property looking its best cosmetically. This curb appeal will help you command the best selling price if you go to sell the home, while also ensuring you always get high-quality renters who can afford to pay top dollar to rent your property. To get more actionable tips on maintaining your rental property and keeping tenants safe, become an American Apartment Owners Association member today. Members receive access to free and reduced landlord forms, discounts at nationwide retailers, and much more.